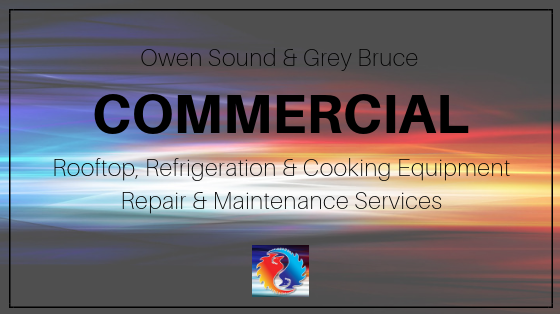 Crose Mechanical works to offer the areas of Grey Bruce and Owen Sound commercial rooftop equipment servicing that supply heating and cooling. We also service and maintain commercial refrigeration and cooking equipment. Crose Mechanical is very prevalent in the commercial industry these days. We have a growing list of customers for commercial refrigeration and cooking equipment for the local restaurants. We also look after rooftops for several commercial buildings that run their heating and cooling system. How Do You Maintain A Commercial Rooftop Unit? The best maintenance is preventative. Get your units looked at and serviced once a year. Some of the rooftop units that we look after, we do quarterly filter changes. When we are up on the roof changing all the two-inch filters, we pay attention to overheated wires and do a quick assessment to ensure there are no evident issues going on. Besides the quarterly filter changes, we do seasonal assessments – heating before the wintertime strikes and then in the springtime for cooling. We can clean condenser and evaporator coils, check amp drop or compressors and circulating blowers, and check the ignition system for trouble-free winter service. We maintain the rooftop units so that they work optimally year-round. What Companies Do Crose Mechanical Service in Grey Bruce? We look after the Professional Center in Owen Sound. We have worked at Transcontinental and Tenneco, as well as a variety of restaurants, hotels, and seniors homes in the area. Do You Need Your Commercial Equipment Serviced? Contact us and we can discuss your needs and what we can do for you. Servicing Owen Sound and Grey Bruce Counties from Kincardine to Markdale, Meaford, Thornbury, Port Elgin, and Saugeen Shores up the Bruce Peninsula to Tobermory. Locally owned & operated + free estimates. Call us now! © 2019 Crose Mechanical. Designed by Gem Webb Internet Marketing and Web Design. All Rights Reserved.